This is the second part in a series of three articles focused on the development of an IoT application. It goes on about the reading of sensors and sending of gathered data to the cloud. The embedded system chosen for this purpose was a Toradex customized SBC solution: the Colibri VF61 SoM + the Iris Carrier Board. As a retrospect, the Image 1 presents a block diagram that illustrates the idea of the whole application documented in this series. The MPU-6050 already has a Kernel module to interface with Linux applications (Kernel version 4.4.0 revised for the Toradex Vybrid CoMs). See this document containing the device tree fragment needed to enable the hardware interface of the sensor. Since this module isn't added to the Kernel out of the box, there is the need to include it. In this case, this article has detailed instructions on how to configure, compile, and update the Kernel. Once the MPU-6050 has the same I²C address of the on-module RTC (0x68), the easiest solution found to solve the issue was to set (connect to +3.3V) the AD0 pin of the MPU-6050, which luckily changes its address to 0x69. The HC-SR04 has a module posted on Github which was forked, modified and compiled for the Kernel version 4.4.0 to work with the Colibri VF61. The code and also the compiled module for the Toradex CoM can be found here. The GPS module communicates via UART and it is interfaced using the GPSD service. More information about GPSD can be found here. If you want to build your own image, there is an OpenEmbedded recipe available for the GPSD service. The USB Wi-Fi dongle WL250N can be used out of the box, however there is the need to configure the network to be connected to. Instructions on how to configure the connection can be found here. Regarding the connections between the modules and the Iris Carrier Board, only pins from the x16 connector – the pin header – were used. The Iris Carrier Board technical datasheet holds useful information about interfaces, connectors, etc., and there is also the Colibri VF61 CoM datasheet, for further consulting, if needed. The Table 1 presents the correspondence between the Iris pins and the modules pins. The Image 2 illustrates the connection of the MPU-6050 and the HC-SR04 in an early stage of development. After all of the modules were interfaced to the Toradex embedded system, the next step was to embed it in a remote controlled car, as displayed in the Image 3. It is a straightforward process, but some considerations about it may be useful. 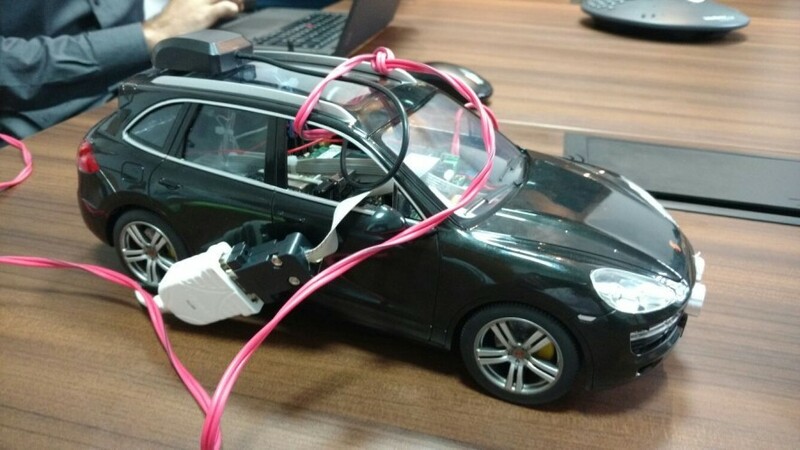 Since the GPS module has an active antenna, it was placed under the Toradex system and then the antenna was attached to the outside of the car roof. To accommodate the ultrasonic ranging module, a pair of holes was added to the bumper, as described in the Image 3. 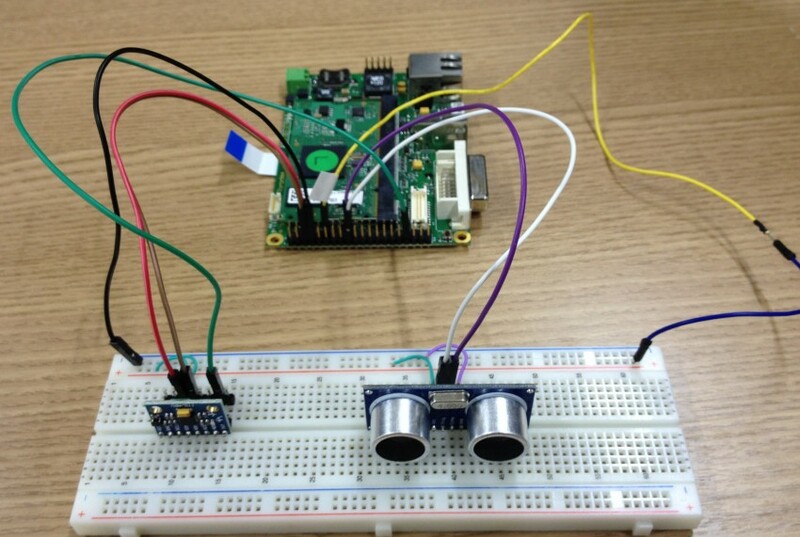 The accelerometer module was firmly attached to a printed circuit board of the car, since the PCB orientation was parallel to the ground, allowing the use of the module data without further calibration (though it may be desired for a real application). Regarding the embedded system power supply, a 2 cell (2S – 7.4V) LiPo RC battery with 1200mAh of capacity was chosen. Considering that the system current is around 200mA and that a practical rule to LiPo discharging is that it shouldn't be more than 80% of the capacity, then the system can work for about 4.8 hours. Image 4 displays the final prototype version. The data from the MPU-6050 and the HC-SR04 can be read by accessing the filesystem, while to retrieve the GPS data there is a node module named Bancroft that communicates with GPSD and returns the parsed data. The converted values units are: acceleration - m/s²; gyro - °/s and; temperature - °C. The application that does the reading of this data and sends it to the IoT Hub is a modified version of the part 1 application, send_data.js. The file that corresponds to the current application is the send_data_from_sensors.js and can be found in the Github repository that was cloned into the board earlier. The main considerations about the modified code are that the Bancroft module emits events whenever it reads new data; also the paths to access the sensors modules are /sys/bus/iio/devices/iio:device2/ for the MPU-6050 and /sys/class/hcsr04/ for the HC-SR04. Below, some parts of the code are going to be explained. The function getAllSensors called above will be omitted, nonetheless it is very simple: it updates the embedded system current time stored and then calls the function readSensor() for each possible measurement - distance, temperature, acceleration on 3 axis and gyro on 3 axis. readSensor() itself just reads from a file and prints error to the console, if it is the case; otherwise it is pretty much the same as readFile(). So far, in the first part of this series of articles, the project goals and an overview about the Internet of Things were given. Then, the Azure IoT Hub service was configured to receive messages from the Toradex embedded system (and also send messages, though it is not explored in this project), some considerations about sending data from the embedded system were made and, finally, a way to get the data from the cloud was presented, in order to verify that everything was working fine. Then, the current article focused on the embedded system part of the project. It started with the steps taken to interface the sensors/modules to the Colibri VF61 + Iris Carrier Board and went to the specifics about the Node application. With all of this set, the points to be explored in the next article are the use of the Azure Stream Analytics and the Microsoft Power BI to filter data and display easily understandable outputs, in order to ease the job of extracting useful insights and generating business intelligence out of it. 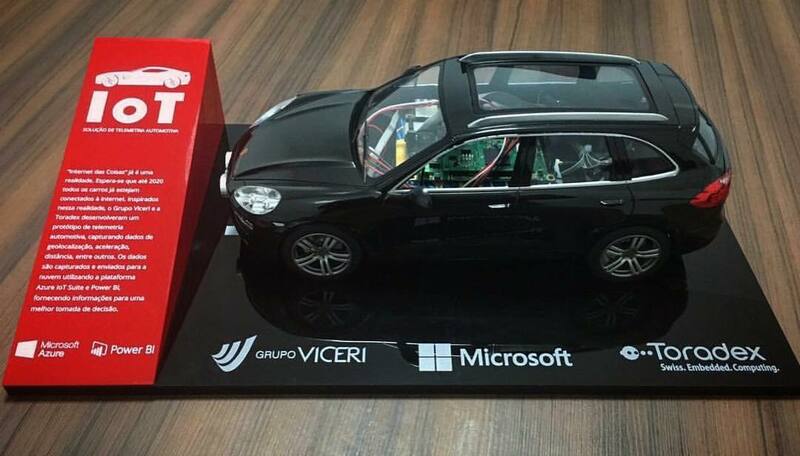 I hope it was a helpful article and also, I would like to thank the Grupo Viceri team from Brazil for their expertise regarding Azure and Business Intelligence, that led to the partnership that which resulted in the IoT Car project. See you soon in part 3!